Due to lack of interest the event below has been cancelled. Instead we will run a 5-round, 15-minute tournament. Just the usual £1 in the pot. To mix things up a little and also to raise some funds for the club, our next event at chess club will be a Simultaneous exhibition. To help with planning, it would be great if you could let me know whether you’ll be joining us. Just drop an email to Steve Lovell. For details on the event, read on. Thursday 30 August, 7:15pm at Moreton Hall Community Centre. 7:30pm start, or as close to that as we can manage. Clock simul using the Bury League timing of 70 mins + 15 sec/move. If the games are over with time to spare, we may be treated to some coaching afterwards. Adults should expect to play Mike Harris and juniors should expect to play Jaden Jermy. Depending on numbers in each category, strong juniors may be asked to play Mike or weaker adults to play Jaden. Read on for a little info on both possible opponents. Mike Harris has an ECF Grade of 220, putting him at 73rd in the list of England’s top players. The grade is comfortably enough to earn the title of National Master. Using the standard formula that grade would convert to a FIDE rating of 2350, which would be enough to earn Mike the title of FM (FIDE Master). Jaden Jermy has an ECF Grade of 164, putting him 12th in the list of England’s top u14 players and joint 100th in the list of u18s. Jaden won the Bury St Edmunds Club Championship in both 2017 and 2018 (confirmed just last week). Details of both events can be found on the club website. There have been some great articles on Jaden in the local press, for example here. * Not a member last season, and not a member of another chess club. Your entry fee will be returned. The club championship was held over the summer weeks again this year, and saw thirteen of our members compete in the five-round event. Jaden scored a full five-out-of-five, winning the event by one-and-a-half points. With Jaden having won the 2017 event, there was no danger of his opponents underestimating him this time around. I faced his favourite London system in the second round. My forces swiftly found themselves in an uncomfortable bind as Jaden's kingside pawns marched forward to open up my king, which succumed to a mating attack after a mere 23 moves. His other opponents held out rather longer, but all ultimately met the same fate. Until we reached the final round I didn't see much of Jaden's other games, but the results speak for themselves. Jaden would face Bob Jones in the final round and a draw would be enough to retain the title. Needing to win, Bob used the white pieces to create complications from the outset, and generated a vicious attack using the Morra Gambit. So menacing was the attack that, at least to my eyes, it continued to look dangerous even after Bob lost a bishop by inadvertently releasing it on the wrong square. Jaden navigated his way through the complications, calmly collecting and retaining the extra material, and going on to win. Congratulations Jaden on another very well played event! The following position is from my recent game against Jon Collins in the club championship. I have the black pieces, and it's me to move. White's plan is obvious. 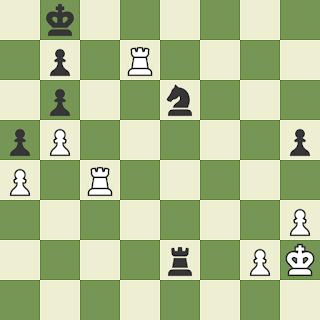 Get the rooks onto black's back rank and mate with Ra8#. Those queenside pawns create a tomb for the black king. According to Stockfish, black's best move is Nc5, but even then it gives an evaluation of +5 for white. Black will die a slow death. In this sort of situation, why not look for a swindle? Swindles rely on the opponent not seeing the danger, cooperating with your sneaky plan when they don't have to, or playing plausible moves without sufficient thought. It can be easy to make mistakes like these when you're clearly winning. That's why I should have tried Ng5. Can you see what the idea is? White mustn't play Kh1, as Re1# is mate. When the desperado rook is invulnerable, but the white king cannot hide from the checks, and taking the rook (unless with a pawn) will leave stalemate! Results and a cross-table for the 2018 event are available here. Following the success of last year's event, we are again running the Club Championship over the summer. Apologies for the late publication of dates. Entrants may nominate one round as a half-point-bye, and must do so before that round is paired. A second bye will be permitted, but this will be a zero-point bye. For the purpose of pairing, a player in the top half of the draw who has received a zero-point bye will treated as having scored a half-point. Failure to play in three rounds will result in automatic withdrawal from the competition. Members may also express an interest in playing as a "filler" if they know in advance they will not be available for sufficient rounds to fully participate. Pairings for rounds 2 to 5 will be made available in advance as soon as the organiser can manage. Games for rounds 2 to 5 need not be played on the listed dates. However, if they are not to be played on the listed dates, the date of play must (a) be agreed by both parties before the date listed for the round and (b) be before the date listed for the following round (or for the final round, on or before the following club night). Where not playing on the listed date, the agreed date of play should be communicated to the organiser, Steve Lovell, before the listed date. This allows a player present on the listed date to claim a default should their opponent be absent, though we will repair if possible. Players will be responsible for sourcing the necessary equipment (board, set, clocks, score sheets), though the organiser may be able to assist if help is required. To prevent delay in producing pairings for subsequent rounds, where a game has not yet been played, it will be assumed to have been won by any player graded 20 or more points higher than their opponent, and otherwise to have been drawn. The players scores will be corrected retrospectively if required. Hammersmith will be bringing 12 players, with a wide range of grades. In addition to meeting us over the chess board, they are keen to meet us off the board, and plan to visit the Old Cannon Brewery when we're finished. As Hammersmith are paying their travel fees and for accommodation, we'll be paying the venue hire. We may be able to get this reduced, but it looks like it'll work out at £7 per player (but you'll get free tea and coffee). Time control: 36 moves in 80 minutes, plus 15 mins + 15 sec / move (from move 1). Those not interested in Blitz may want to go home / to the pub at this stage. 5 round Swiss-ish. Paired BSE vs Hammers as far as possible. As you may have seen elsewhere, the mid-season grades were published yesterday. You can find them via the ECF Grading Database at ecfgrading.org.uk, I hope you're pleased with what you find there! I'd normally also have them listed on our membership page, but the lower half of that is currently broken. I hope to fix it soon!